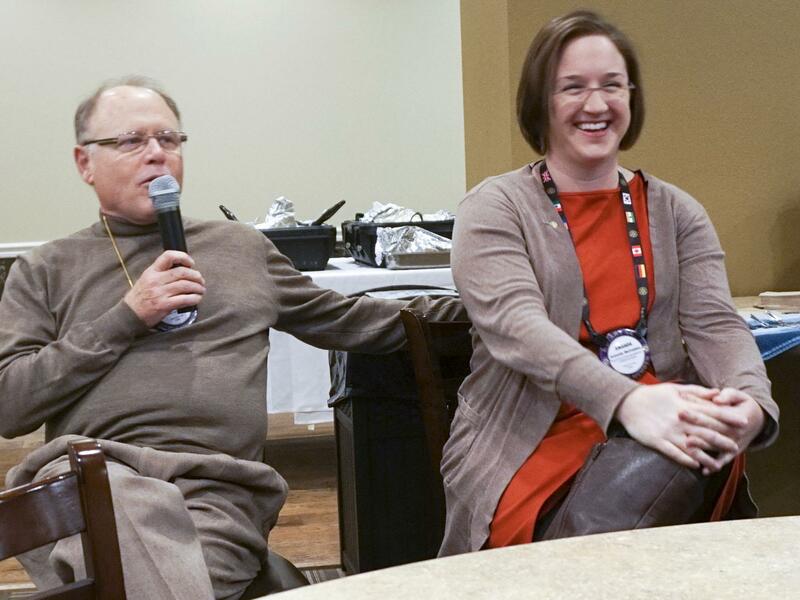 Rotary File for December 5, 2017 | Rotary Club of Iowa City A.M.
Casey Cook led the ever-popular "What Jazzes You Up" with an interview with Amanda McFadden. Then Amanda turned the tables on Casey and interviewed him! Many thanks to Peggy Doerge for hosting the Chili Dinner. Judging by the 43 bowls she washed up afterwards, it was a success. Amy Nicholson announced that Geri Schaefer, who is a former member of AM Rotary, is completing an application to rejoin the club. 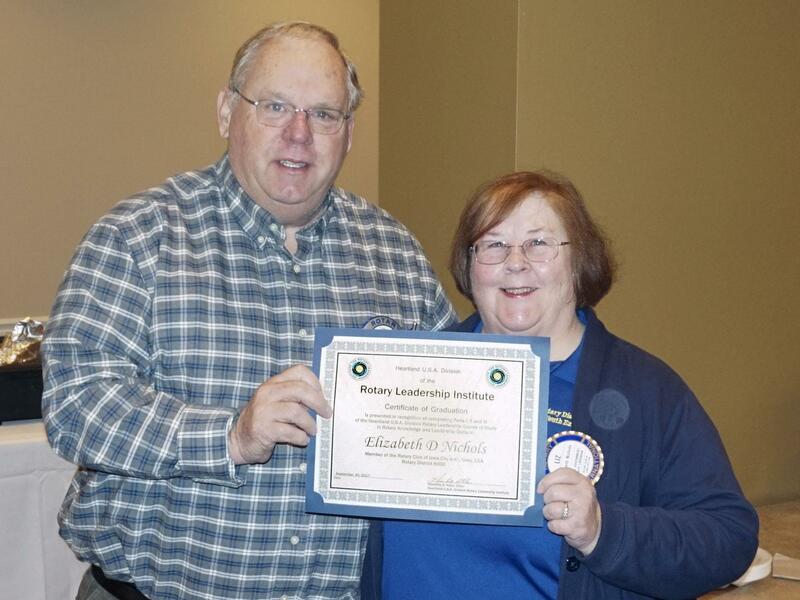 John Ockenfels presented the Rotary Leadership Institute completion certificate to Liz Nichols for her completion of the RLI training program this fall. John emphasized that RLI is for all Rotarians, whether they are new or seasoned. Liz commented that even though she has been a Rotarian for 25 years a large percentage of what was presented was either new to her, or put into a new perspective. 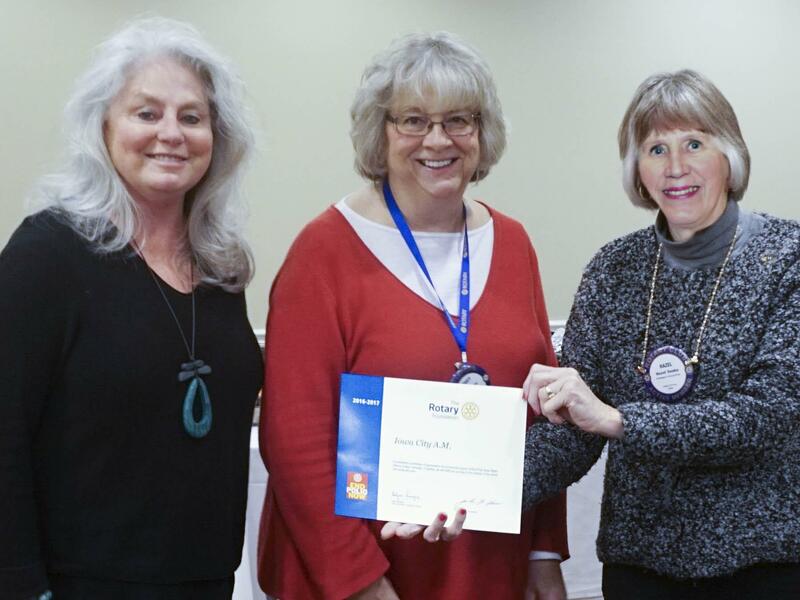 Peggy Doerge presented Deb Dunkhase and Hazel Seaba with a club award for the End Polio Now event they organized in October and the money raised by that event. Please come next week and exercise your vote for the slate running for the AM Rotary Board of Directors and for President-Elect. The P-E candidates are Amy Nicholson and Hazel Seaba. Amy Nicholson is taking orders for jars of salsa and Phil Peterson is handling the order of coffee. The coffee is $20 per bag. Net proceeds will go to AM Rotary projects and grants. Jean Knepper has put together the 2018 Meals on Wheels schedule. Drivers should let her know if there are any changes to the schedule. Deb Dunkhase said that the spots needed for gift wrapping on Dec 24 have been filled. The Iowa Children's Museum is also looking for volunteers for a couple of events this holiday season. See Deb Dunkhase if you'd like to help. Get your money in to Deb Ockenfels to support the World Bike project. Congrats to Paul Ellis for his 25 years as a member of the Iowa City Board of Realtors. Once again, there were many happy bucks shared. Casey Cook asked Amanda McFadden to talk about who or what has particularly influenced her life and given her those qualities of kindness and helpfulness that many have witnessed through her interactions with Rotarians and others. She credited her grandmother for being the person she always wanted to emulate. Amanda said that the job opportunity at UI brought her to Iowa City after earning a Masters Degree at Miami of Ohio. Being a student advisor to international students was a perfect fit for her interests and training. She became a member of AM Rotary after meeting Jim Peterson in Xicotepec and rooming with Jacque Andrews while she was there. She could see that AM Rotary could fill a need she had in her life for a service-involved community. Amanda met her husband in Iowa City through an online dating service just as she was about to give up on that form of finding an interesting partner. At the request of the group, Amanda turned the attention on Casey and interviewed him. Casey grew up in Grand Rapids, MI in a family of 7 boys and 1 girl. He has been in Iowa City since 1985 and has been married to "the woman of his dreams" for 37 years. He also loves his work in the field of commercial appraisal. When asked why he began doing the "What Jazzes You Up" series he said that there is a lot of mileage to be had in interviewing members because there is so much talent and unknown details about each person in the group. Concentrating on getting to know each other helps to build community. He switched from the Noon Club to the AM Club around ten or eleven years ago because of the number of volunteers from our club Mike Messier was able to muster for the Community Foundation golf tournament. He felt this was the kind of club he wanted to get involved in.